While we waited for Alex to arrive, I spoke to Joe Callaghan the GM at Hunt Hollow. 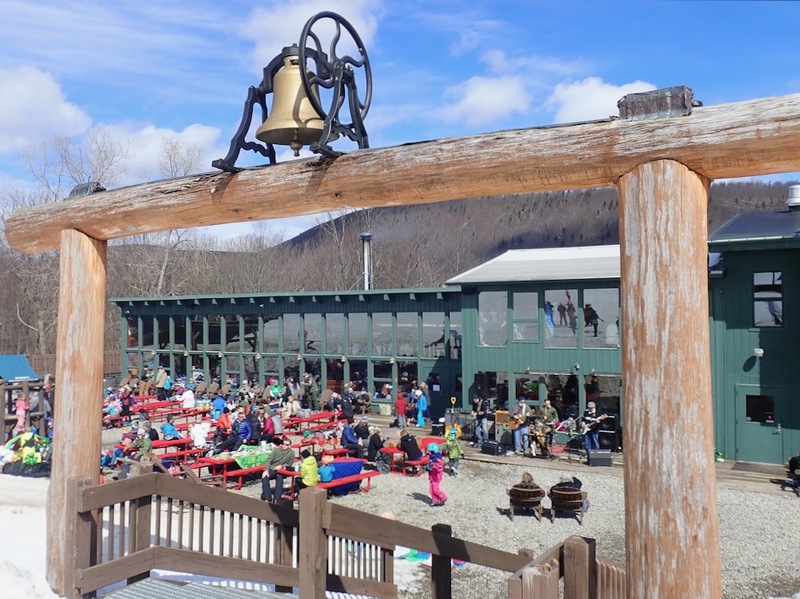 The club recently put in a new chairlift and was making improvements to its lodging and snowmaking. He told me it’s all about the people, it’s like skiing with one big family. He said the après life at the club was not to be missed. He recommended I stick around for the band and beer tasting later. Alex arrived and we headed up the chairlift almost completely alone. Using my father’s Patented Ski System we started at one side of the mountain and methodically worked our way over. The groomers were a bit sticky from the refreeze but the overnight snow settled on it nicely. Once the sun came out in force everything softened up and it felt like we were right back in the middle of winter. We warmed up on the green and blue cruisers to skiers left. 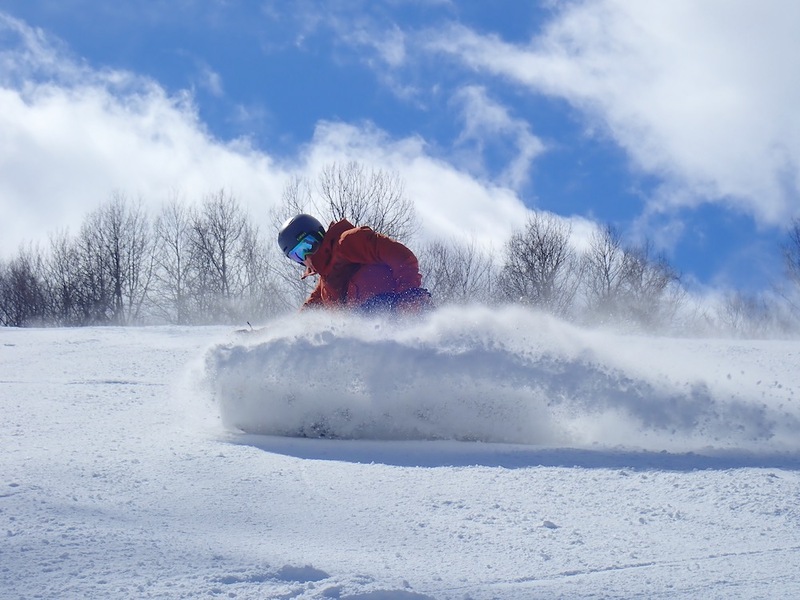 There were some fun rollers set up on Waynes Way, but Fox Run/Big Dipper stole the show with soft sunlit snow and a bowled shape that allowed for some full face carves. Soon the patented system brought us to the steeps of the south slope. 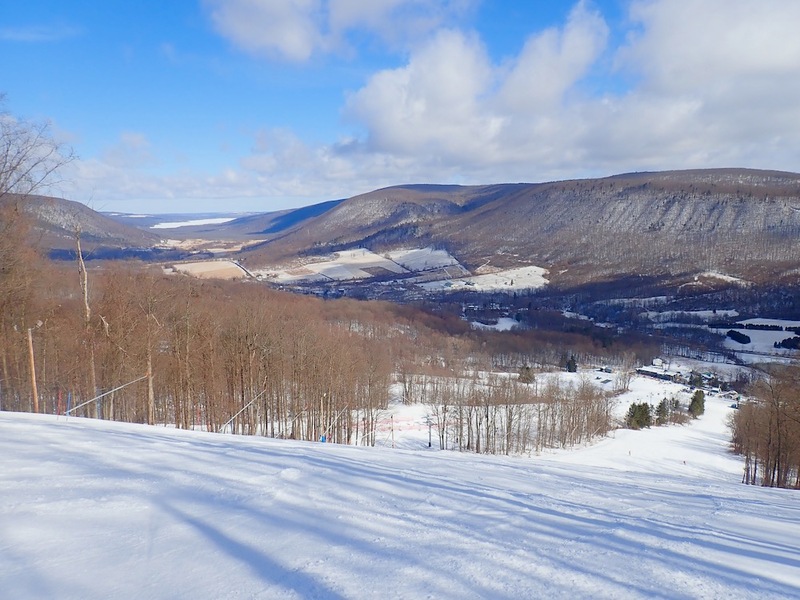 The views are delicious: Off in the distance was frozen Honeoye Lake and if you looked hard you could see the skyline of Rochester. Even more impressive was the sustained pitch of these blacks, which extend to the bottom. These were the best trails of the day and we took multiple runs down Glade and Cascade. I even managed to manufacture a few good “face shots” before we called it quits. 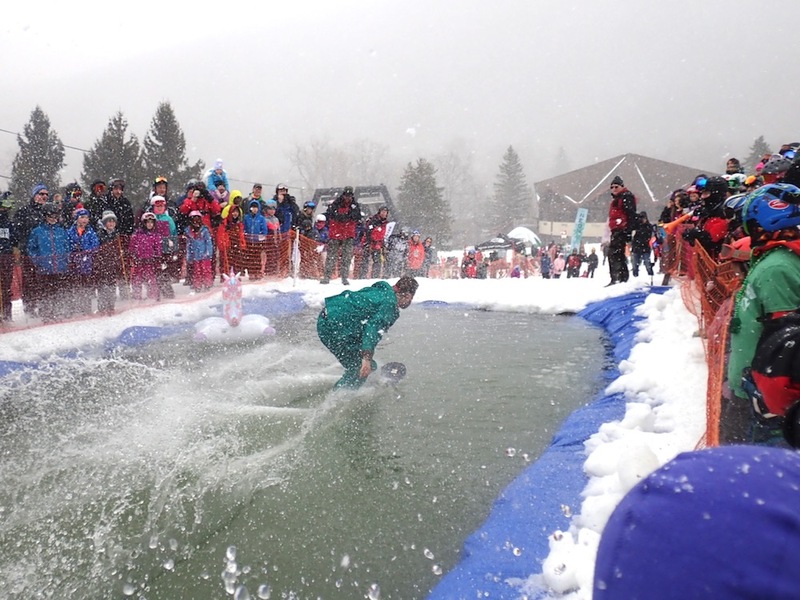 Down at the base, the crowd gathered around for the band, as the staff prepared for pond skimming. We grabbed a local beer from the Twisted Rail Brewery reps and posted up on one of the few empty tables outside. It was sunshine and smiles on the patio as classic rock blared through the amps. Joe was right, this seemed like the place to be. My soon to be retired father contemplated the benefits of a weekday membership for next season. I was left wondering… when can I retire? I don’t live any where remotely close to this place, but just out of curiosity, what does a membership entail, and how is it different then a season pass? Membership is a one time upfront fee, and then each year you renew a season Pass. There are around 400 members (individual and families) so the obvious is perk is an empty slope. The public is only allowed access Wed through Friday. Besides that, the club is as much social as anything and there many events year round. There is the added value of safety, no need to worry about theft or children for that matter. Beautiful article. Well said. Hunt Hollow is a jewel of the Fingerlakes! Your Dad should go to the ski company ski sale in September and pick up a weekday season pass for a very reasonable price. I’m retired and this is my third year and it’s been nothing but a pleasure. 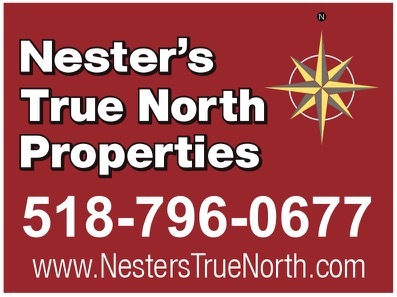 Really you can’t beat it, friendly people, good food, no lines, helpful staff, I can’t say enough! 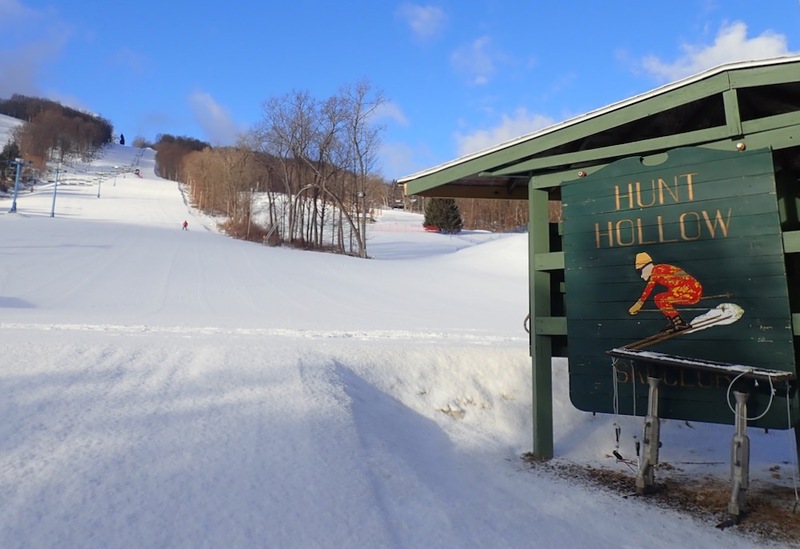 I always enjoy our annual USSA NY Masters race there-Glade is a nice race hill.